Union County was born from political compromise. Democrats wanted the county named after their hero, Andrew Jackson. The Whigs, however, wanted this new county named after theirs, Henry Clay. When they could not come to an agreement, it became “Union” County in honor of bipartisanship (Clay and Jackson Counties would both be formed later, in the mountains). Located on the South Carolina border, Union is dark red politically, and populous. It is a perfect example of a typically conservative, exuburban county. From 2000 to 2010, the county grew by an astonishing 62.8%. This massive growth rate has not affected the county’s conservative tendencies. Though largely rural and suburban, the county is quite wealthy, with many of its residents commuting to Charlotte for work. The growth of Union County helps to explain the growing Democratic nature of its huge neighbor, Mecklenburg. Not only is Mecklenburg seeing growth from Democratic-leaning voters, many of Mecklenburg’s Republican voters are moving out to Union County. Prognosis: Although Union County has grown quite a bit since 1988, it is still solidly Republican at the presidential level. In the past, Union had a large population of DINOs, voters registerd as Democrats who voted Republican at the federal level. It was a typically rural, tobacco-growing area, similar to the rest of the state. Farmlands, however, are being bulldozed for new subdivisions, new office buildings, new restaurants. Growth is the name of the game in Union County and it is likely to be that way for a long time to come. Although Union trended toward the Republican Party in 2012, and provided Republican Mitt Romney a margin of almost 30,000 votes, there are some bright spots for Democrats. One is the tendency for exurban counties to “mature” and become more hospitable to Democratic voters (see Gwinnett County, Georgia). Another is the county’s burgeoning Hispanic population, which grew by 174.54% during the 2000s. Its county seat, Monroe, the boyhood home of Jesse Helms, now boasts a Hispanic population of 30%. 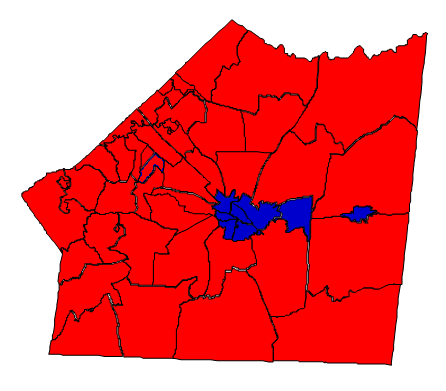 The city of Monroe was also the only area of support in the county for President Barack Obama, with the exception of majority-minority Marshville. The bottom line: Union County is changing rapidly, but its growth is not helping Democrats – yet. Instead it has become a treasure trove for Republican votes, and is likely to remain especially important for GOP prospects in years to come. If Democrats want to boost their numbers in the county, their best bet is too register as many Hispanics as possible. For now, though, that is about it.